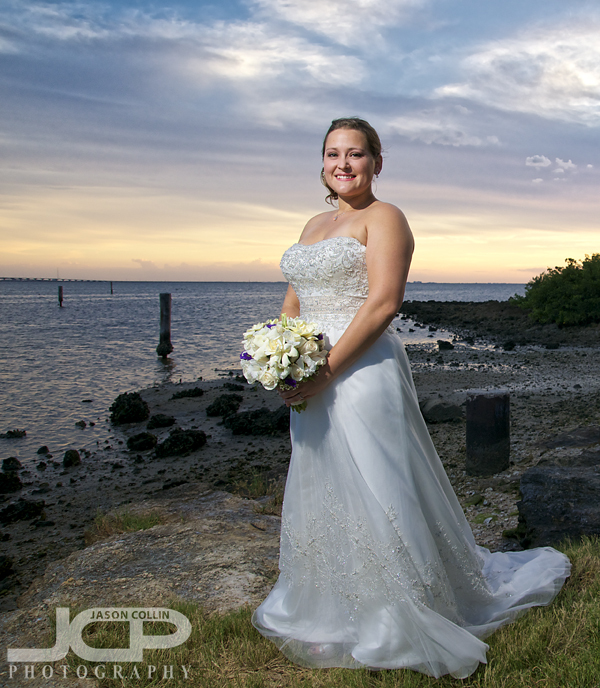 Reserve your beach wedding with Jason today for your own vivid sunset portraits! There are always challenges photographing a wedding, but for me personally this was the most difficult due to the news I got about the oldest member of my family when I first woke up that morning. I have a strong ability to compartmentalize so I rallied and once I first put the camera up to my eye, no one all the six and a half hours I was on site at the Bilmar Hotel on Treasure Island had any idea what I was really feeling inside. Wedding rings hung from a necklace with a cross - SETUP: Nikkor AF-S 104mm VR micro f/2.8G lens @ f/11 ISO 200 1/100th SB-800 @ 1/4 power hotshoe mountedThe wedding rings were with the bride, Jessica, in her hotel room, which is unusual as the groom tends to keep them on hand. Looking for a good place to photograph the rings, I recalled what I did for a Christmas wedding last year, which was to hang the rings from a string type object. The bride took off a necklace she was wearing an assisted me in getting this shot. The cross was already on the necklace. The view from the 7th floor of the Bilmar Hotel - SETUP: f/8 ISO 200 1/60th STROBIST: SB-800 @1/4 power to frame right & SB-600 @ 1/4 power to frame left both handheld by volunteers!The bride had a very loyal wedding dress assistant her continued her job the entire afternoon and evening. For the above shot I had two volunteer assistants hold my speedlights as there was not much space at all to setup a pair of light stands. The weather looks great outside right? Well, to the east clouds were rolling in fast and within 20-minutes it was raining right at what was to be the start of the ceremony. There was only a 30-minute delay which was actually welcome, allowing the bride more time to get ready and the guests to cool off in the reception area. The groom is pointing at you - SETUP: f/5.6 ISO 400 1/60th SB-800 @ 1/4 power hotshoe mounted & a room lamp providing backlightI learned a new trick for shooting in hotel rooms: use one of the room lamps as a backlight in tight quarters. I had the groom, Justin, and the other groomsmen squeeze between two beds causing them to get into a fan-like pose and also allowing the table lamp to backlight them. This is definitely a type of shot I will be doing again in the future! Treasure Island Beach calm after the storm - SETUP: f/11 ISO 200 1/200th SB-800 @ 1/4 power hotshoe mounted - B&W processing using Silver Efex ProOnce the rainstorm passed it was kind enough to leave behind all sorts of clouds decorating the sky. I much prefer clouds to a cloudless beach sky. Not only are day time photos much better, I think sunset shots with clouds are much more dramatic as well. The groom cries upon seeing his bride - SETUP: Nikkor AF ED 80-200mm f/2.8D lens @ f/5.6 ISO 200 1/800th using natural lightIt was an emotional moment for the bride and especially the groom once the ceremony began. For me, it is nice to see as I like to see people express genuine emotion. It also of course helps the photographs. Tall grass sand dunes of Treasure Island - SETUP: f/11 ISO 200 1/160th STROBIST: SB-800 @ 1/4 power to frame left & SB-600 @ 1/4 power to frame rightThe bride in a quiet moment faces the Sun and the Sea. This type of shot, where the subject is not looking into the lens but rather off into the distance is my favorite type of portrait. For me, I wonder what the subject is thinking about. I hope that some years down the line when the bride looks at this image, she, herself, will also wonder what she was thinking of at that moment. A vivid sunset falls on Treasure Island St. Petersburg - SETUP: NIKKOR AF ED 80-200mm f/2.8D lens @ f/8 ISO 200 1/100th STROBIST: SB-800 @ 1/4 power to frame right & SB-600 @ 1/4 power to frame leftAfter I took the final photograph of Jessica & Justin at sunset time, I had a few moments alone as I packed up my strobist gear and they started to walk back to the hotel for the reception. This gave me a few seconds to send my own thoughts out to the horizon, as I do every day, but even more so that time. 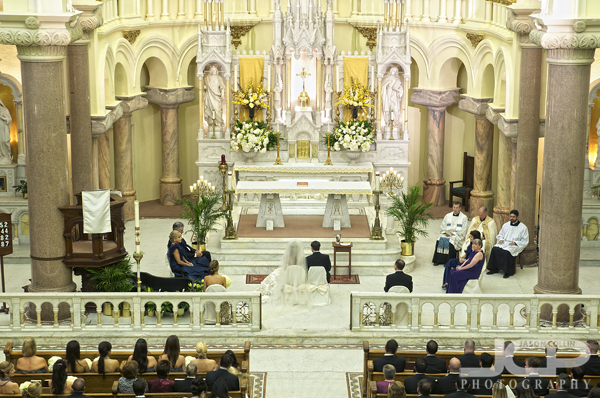 Sacred Heart Church Tampa Wedding Ceremony - f/8 ISO 200 0.8s on tripod with cable releaseThe wedding of Ryan and Monica was the grandest wedding I have been involved in photographing so far. Monica's father must really, really love her! This was also my first opportunity to not only photograph a wedding inside the spectacular Sacred Heart Church in downtown Tampa, but just to see inside of it after long admiring its large circular stained glass window on its front face. The groom getting some necktie help from his father - f/8 ISO 800 1/100th SB-800 Speedlight hotshoe mountedMy day started out photographing the groom getting ready in his spacious waterfront room in the Tampa Marriott Waterside. The NBA channel was on and causing a bit of distraction as one of the classic playoff series between the 90s Knicks and Pacers was being broken down game by game! Everyone in the room got a bit caught up in it. The bride getting assistance with her floor length veil - f/5.8 ISO 800 1/200th SB-800 Speedlight hotshoe mountedI was next on my way to the Sacred Heart Church to photograph the bride as her assistant helped her put the last, tricky touches on getting her head to toe length veil just right. The woman helping the bride seemed like an expert, but to my ears she spoke mostly only Italian! It made me feel like I was in a movie to be inside such a architecturally rich church, seeing an enormous veil enveloping the bride, being put on by an old, petite Italian woman. Palma Ceia Country Club Wedding Reception Ballroom - f/5.8 ISO 800 1/80th SB-800 Speedlight hotshoe mountedThe reception was at the Palma Ceia Country Club where I photographed a wedding last October. I thought I knew what to expect but the reception this time was in a much different room and even the manager said he had never seen the room decorated like it had been. 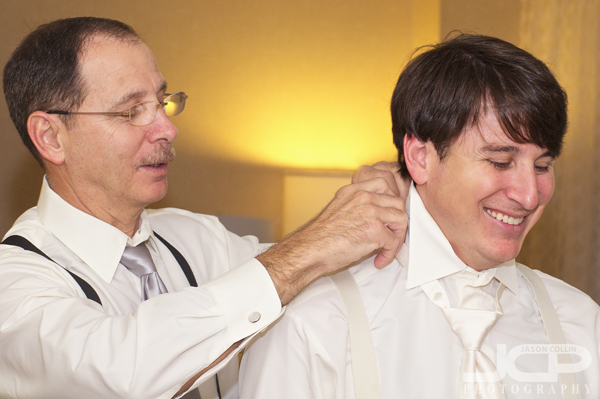 The preparations started at 5:30am that morning he told me. Wedding day hugs and congratulations - f/5.6 ISO 800 1/80th SB-800 Speedlight hotshoe mountedOne type of shot I always look for is what I refer to in my mind is the "hug & kiss" time for the bride & groom as they receive congratulations from the wedding guests. To me the intensity of this time tells me a lot about the wedding, the newlywed couple, and the types of relationships they have with everyone at the wedding. The hugging at this wedding, as you can see above, was as impressive as every other aspect of this lavish, emotional wedding. Bradenton Wedding Photography in Calvary Baptist Church - the bride, KieraI photographed my first wedding in Bradenton, Florida, which was held at the Calvary Baptist Church and then on to the nearby Renaissance banquet hall for the reception. However, I first met Kiera in her family home that she grew up in. As I walked up the staircase to the second floor the wall was lined with childhood photos of her and her siblings. It was really nice to get to see some of her family history before taking one photograph that day. Hopefully I will have produced a photograph worthy of placement on that wall. 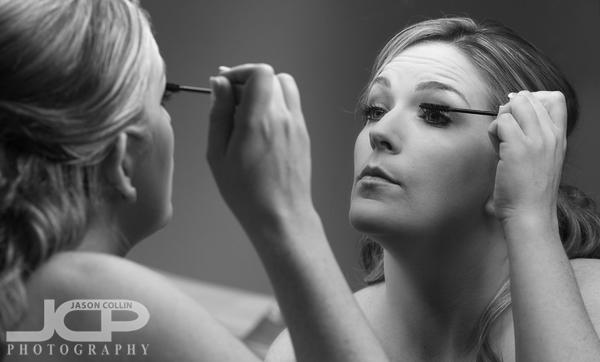 The Bradenton bride getting ready - Nikon D300 Tamron 17-50mm @ f/5.6 ISO 400 1/100th strobist: SB-800 on light stand to frame left & SB-600 on chair to frame rightOften, just by watching people I find shots I would not have thought of myself. The mirror was on the far side of the bedroom and was not being used. As I was getting ready to setup for a staircase shot, I saw Kiera go over and look into it. I always like to get a reflection shot of some kind and after working a bit on the lighting logistics was able to get my second strobe placed so that I could both back and front light Kiera without producing any glare in the mirror. Entire wedding party in Calvary Baptist Church Bradenton FloridaThe wedding party was rather large and included four energetic kids and one very long wedding dress train. This was perhaps the most difficult shot all day to get right as on top of the tech stuff for producing this kind of shot (off camera flash, correct exposure in a large dim room, etc) I had to make sure eighteen people all lined up without significantly blocking anyone and keep them all from trodding on the bride's beautiful, but expansive, wedding dress. A riverfront location picked by the bride in Bradenton Florida after the wedding ceremonyThe bride had mentioned going to a riverfront location after the ceremony, which I thought sounded good. The more environments I can photograph the bride and groom in the better. However, after the ceremony the bride was not so sure of making the effort to go out there and perhaps we would all just head to the reception. I highly recommended that we make the effort to go out to the riverfront because ten years from now I am sure she will be glad that we had. This is also part of the professional wedding photographer's job. Bride & Groom action shot after their Bradenton Florida wedding by the limoThe above shot was my idea as I always want to try and include some action shots if possible, even during a wedding. Kiera & Ricardo would good about following my suggestions for shot ideas despite both of them wearing far more restrictive clothing than myself. This was a spontaneous shot I did not have preplanned, just thought we could do something on our way to the riverfront. Wedding Bliss under the bride's veil in Bradenton Florida - natural lightThis shot, however, was preplanned as soon as I saw Kiera putting on the veil in her grandmother's bedroom. It is always great when the bride wears a large veil. With the wind it took a bit of finagling to get the veil as good as we could and keep it from blowing all over the place. I think this was the time Kiera & Ricardo enjoyed the most while I was photographing them that day. 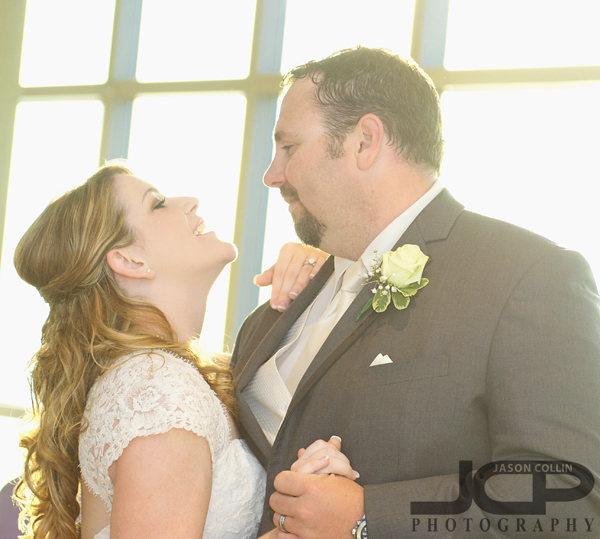 Reserve your free wedding photography consultation with Jason today! The new look & slogan for Tampa Clearwater St. Petersburg wedding photography promotionsFor Spring 2011 I am launching the "Why is this bride smiling?" 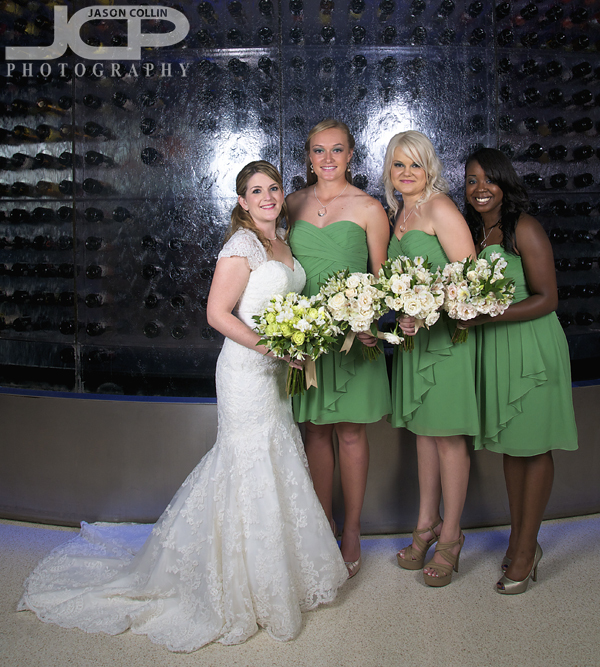 promotional campaign for St. Petersburg, Tampa and Clearwater wedding photography. The ads themselves are more colorful using the same tone of blue found in my logo and feature a floating circles design theme. "Why is this bride smiling?" -- The intention behind this question is to promote the emotional aspect of my wedding photography for Florida brides-to-be (and grooms too!). Instead of initially focusing on specific package details, pricing, etc., I first want the engaged couple to think of the emotion they want from their wedding photography, what they want the experience to be and how to capture those emotions and experiences. If the engaged couple feels connected to the emotions of my wedding photogrpahs and wishes to experience and preserve what I have done for others on their wedding day also, then the time for discussing package details & pricing can follow. I realize price is a strong factor in purchasing decisions, but wedding photography is not like buying a refrigerator. For all of the above reasons I offer a free, in-person wedding photography consultation to determine if my wedding photography philosophy matches with a specific couple's wishes. Even if someone looks through my full online portfolio, downloads and reads my Wedding FAQ, reads all the raves and reviews, I will always highly encourage meeting in person before the couple decides on myself or another photographer for their wedding so I can in my own words answer the question, "Why is this bride smiling?" This collection of five photographs are my personal favorites that I made in 2010, all from a different category. All the images were made in the St. Petersburg and Pinellas County areas. All were taken with a Nikon D300 DSLR. This HDR shot was taken on Sunset Beach, Treasure Island, Florida while teaching a DSLR photography lesson to a student. It is amazing how little I have gone out by myself to photograph the dramatic sunset and twilight skies that are the highlights of fine art photography for Florida. If not for teaching a photography lesson that evening, I would never have made this shot, so I am very glad I did. Why I chose this shot in particular is for the mix of colors ranging from purple to yellow tints, to the pink reflecting off the clouds in the left-center. There appears to be a kind of vortex opening and my imagination always believes something fantastic just might pass through to our world. Read more philosophy behind this shot. It was easy choosing this photograph of my own beloved puppy, Kiki. For me it is two things about this photograph, first, her sandy snout. Second, and most of all, it is the super creamy bokeh created by the awesome Nikkor AF ED 80-200mm f/2.8D lens. It was a really hot August day at the dog beach part of Honeymoon Island State Park. The light was extremely harsh. Not the conditions one thinks a well exposed image can be made in. Thanks to the Nikkor lens and thanks to Kiki having black fur, the harsh summer light served to show detail in her fur not normally seen in photos. I have an 8x10 mounted print of this image on the nightstand by my bed. It is the last thing I look at before I go to sleep every night. Read more about that day at the beach. I cannot take complete credit for this portrait. Placing their heads together was the mother's idea. I take many portrait photographs over the course of a year, so this was perhaps the toughest category to choose a single favorite. It might be odd to choose as a favorite portrait an image where you cannot even see the subjects faces, but to me, that is one of the reasons why I chose it as my favorite. The viewer has to use her/his imagination, not just for wondering what their faces look like, but also for what they might be thinking and feeling at that moment. I hope it is something this mother and daughter continue to wonder twenty years from now. This was an easy choice, and I knew it would be my favorite wedding shot of the year the second after I took it. As soon as I saw Rosa in her veil, I got excited because I knew, finally, I would have a chance to make bride/veil shots, which are some of the most beautiful a wedding photographer can produce. Again, I was greatly helped by both Rosa and her big smile, as well as Mother Nature for being able to make this shot on Pass-A-Grille beach at the very tip of St. Petersburg. View the Bride Series images of Rosa. As soon as I applied the sepia landscape filter to this image in Silver Efex Pro, it became perhaps my favorite black & white image I ever made. This was not shot in a studio, but right on Sunset Beach, the scene of many other photography sessions this year. I still consider this a candid image, my signature type of shot, even though the grandmother was aware I had set my light stand next to her and had taken a position some paces away with my camera. Her granddaughter I believe had no idea of my presence. The contrast between the granddaughter facing the lens, but eyes to frame left, and the grandmother in profile lips just slightly pressed against her granddaughter's cheek, are what make this shot my favorite of 2010, in addition to the magic Silver Efex Pro does for black & white image conversion. Read more about the inspiration for this photograph. You really never know where you might find a wedding photography job. Back in February I was still considering other work to supplement the photography business. I was at some nursing college in Tampa to interview for an English teaching position there. One of the other two applicants was Mary. During the mind numbingly boring 2-hour class we were "requested" to sit in on we got to talking and it turned out she was engaged and did need a wedding photographer. 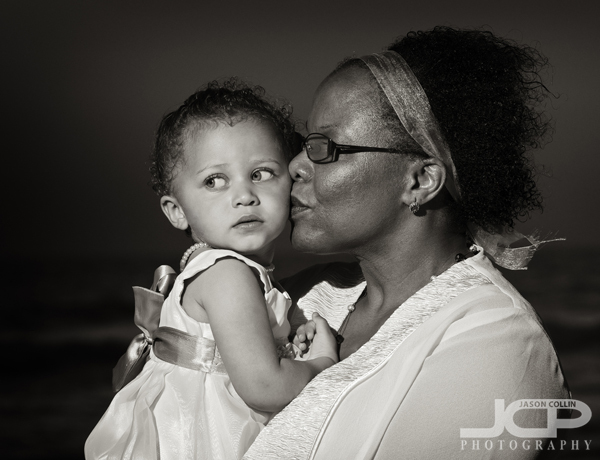 From that very chance encounter, it ended in me photographing her wedding to Jason at the Rusty Pelican along Tampa Bay. Oh, and though we were told we were the only candidates for the jobs, no one was ever contacted again! Inside the lobby of the Westin Hotel in Tampa was this very cool waterfall background that presented a challenge to photograph well. 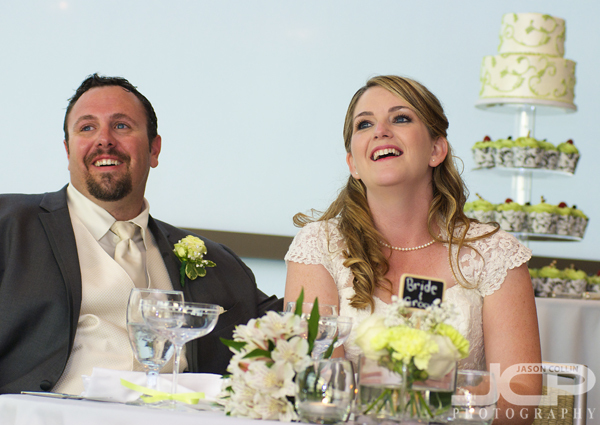 I started photographing their wedding from their apartment near downtown Tampa. Mary was getting ready there as well as the bridesmaids. Then I was off to the Westin Hotel to meet Jason and the groomsmen. The lobby of the Westin was really cool looking and I was excited to have a very modern looking glass waterfall to use as a background. I have to admit it took me quite a few tries to finally get the exposure correct so that the colors in the waterfall could be seen and that the groomsmen were all adequately lit up. To get the above image, I had to use a settings combo that I never had before. I had to have very steady hands while using 1/40th of a second shutter speed. 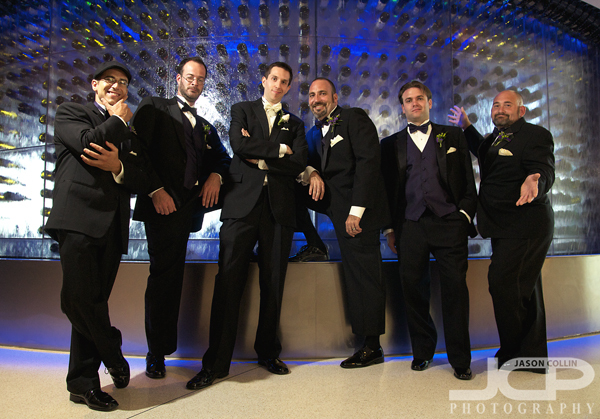 I told the groomsmen to likewise hold there poses as statuesque as possible. In the end I was very pleased with the results and gained a lot of new experience from shooting in such a unique location. At the Rusty Pelican, father of the bride walks her down the aisle to give her awayThe weather cooperated perfectly for Jason and Mary's outdoor wedding ceremony at the Rusty Pelican. It was not even that hot. 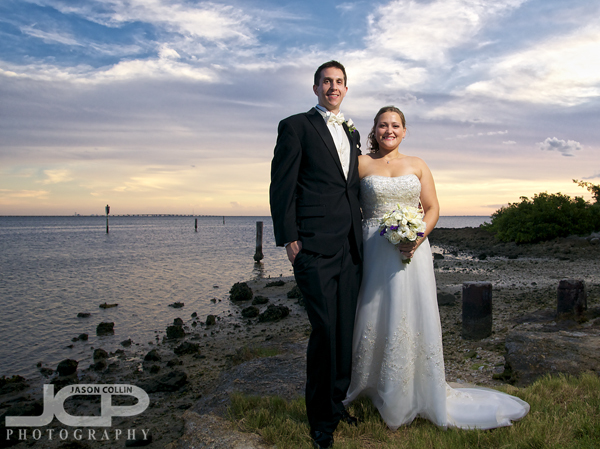 The sky had just enough clouds to make an interesting backdrop for the ceremony and later the formal portraits. Nikon D300 Tamron 17-50mm @ f/5.6 ISO 200 1/80th Strobist: SB-800 to left and SB-600 to rightThere were two other weddings earlier at the Rusty Pelican. We were fortunate to be last because that meant I was already well setup for getting the best sunset and twilight backgrounds for my photographs. Two other photographers had to scurry for lesser spots. Making a group portrait like this at twilight would not be possible without a 2-strobe setupOver the course of this year I added a second strobe to my strobist setup for sunset and twilight portraits. This allows me to properly light a wide group of people like the nine adults in a row above. 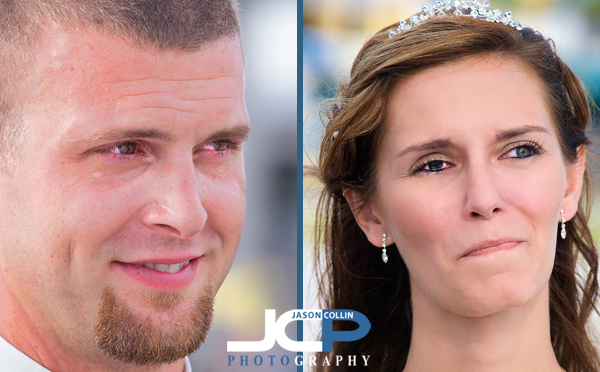 This is one rare, highly specialized skill that is available to clients who choose Jason Collin Photography. A Wedding Kiss at Twilight from the Rusty PelicanOn their shot list, Mary and Jason wanted a photograph of them under the Rusty Pelican sign. Time was running short, as often tends to happen with wedding photography, so as we were walking in to the reception, I had them stand under the sign while I quickly setup my 2-strobe technique with my camera bags being hurriedly tossed aside (closed though!) and was able to get several different shots of them while placating the Rusty Pelican staff person urging them to get inside to their guests. For me, that was the last tough, time pressured shot of the night. From there it was off to the free flowing shooting environment of the wedding reception. Mary and Jason's wedding was a great technical challenge that allowed for me to produce some of my most creative shots of the year.